First flight with bubs? Yes, it can be pretty daunting but being prepared and well organised will help big time. Keep travelling with babies as stress-free as possible by following these 20 tips from some jet-setting Juggle Street parents. Some time ago in the years BC (Before Children), a friend who’d just returned, shattered, from taking her 6-month-old son to Scotland to meet the rellos wanted me to know how it felt to fly with a baby. So she shut me in her very tiny guest toilet for five minutes with her baby. Emerging somewhat frazzled, she said to me: “multiply that by 22 hours and that’s what it’s like.” Eventually flying with my own baby years later I realised the comparison was pretty spot-on. Here, we’ve compiled some useful tips for first-timers from a bunch of mums, dads and nannies so you can benefit from our experience – and don’t repeat our many mistakes! 1. In airline-speak, ‘infant’ means a child under 2 years. If you’ve booked online they are booked without a seat and must travel either in the lap of the adult travelling with them or be placed in the bassinet if available in-flight. You’ll also need to check other airlines’ policies in relation to infants occupying a seat to prevent any drama if changing carriers in transit. On Qantas domestic services, for example, lap infants can travel on their parent's tickets. For international services, infants must have their own ticket. Healthy newborn babies may travel after 7 days of delivery. Airlines do not recommend you travel before this period and you’ll require medical clearance. Don’t bring the whole nursery with you. You’ll just need a toy or two, such as a favourite teddy. With older babies, wrap a new toy so they can enjoy unwrapping it, which will buy you a few minutes’ free time. Pack a change of clothes for you and baby – light layers are best for you both. A baby sleeping bag is a good idea for long-haul flights. Many seasoned travellers rightly recommend a pashmina as an essential travel item. These light, warm cashmere wraps make ideal travel blankets. They pack down to nothing, come in lovely colours and can dress up an outfit so you’ll disembark with a semblance of style – and cover any baby food or vomit on your top. They’re an ‘investment piece’ but well worth it. Choose your main suitcase with wheels if you’re planning on carrying your baby on your chest. Having a backpack on your back and a baby up front is not a smart option. Carriers, slings and wraps are not just great for airports, they also help baby fall asleep in flight and keep your hands free. Request an aisle seat, which will allow you to move around without disturbing your fellow passengers. One parent recalls her baby drooling on the heads of other passengers as she clambered across them from the window seat. Book the bulkhead, the row with no seats in front, as it gives extra leg room. Check the hand luggage allowances with your airline. Some allow a nappy bag as additional hand luggage; with others you have to combine everything in one bag. If it’s the latter, place nappies and wipes in easy reach, such as in a side pocket or pack on top of other items. You’ll also need to check the airline’s restrictions for carrying liquids. Most allow 100ml in liquids which must fit into one transparent and re-sealable plastic bag like a zip-lock sandwich bag. Liquids include baby lotion, nappy cream, sunscreen and any other products you’re taking. The liquid limit does not apply to the milk or food. You can carry expressed breast milk or formula, and boiled water in a bottle to make a feed. 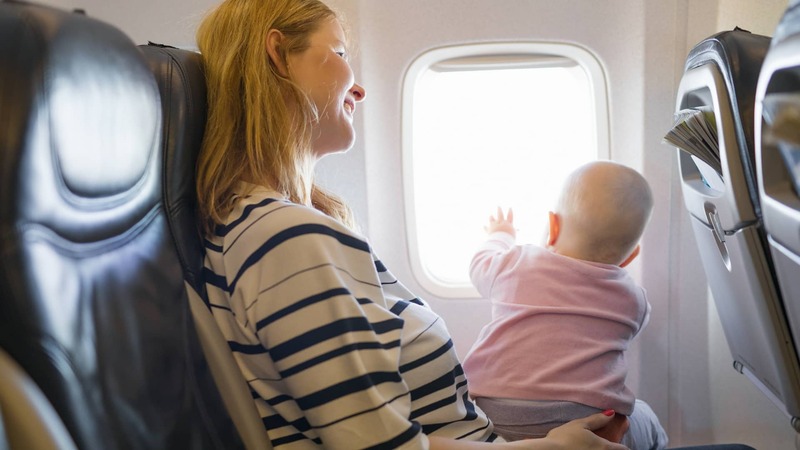 Your baby is likely to drink more in-flight due to the dry, air-conditioned environment. The change in cabin pressure will often upset little people, so keep a dummy handy, or save bottle or breast feeding for taking off and landing. The sucking action will alleviate the pressure on your baby’s ears and help them ‘pop’. Some airports offer a reserve-and-collect service for formula, so you can collect it from the departure lounge before boarding. Find out in advance if the airline will reheat milk and baby food in flight. Some airlines offer baby food you can pre-order so ask when booking. Pack extra milk and food to allow for flight delays. To make your time on the ground easier, most mainline Australian ports have strollers available for you to use once you have checked-in your own stroller. Board last. Many airlines will allow families traveling with infants to board first but it can be a good idea to wait, especially if your baby is awake. Why? Because once you’re on board you’re stuck in your seat waiting for everyone else to board and clamber over you in the aisle seat. The less time you are sitting in your seat the better to prevent the baby becoming restless being stationary any longer than necessary.